The Human Resource Development Centre (HRDC) has been sponsoredby the University Grants Commission under the National Policy of Education, 1986 (NPE). The NPE recognizes the need for improving the status of teachers and proposes to provide opportunities for professional and career development. It is generally recognized that the present system of higher education does not provide opportunities for the professional development of teachers. At the same time, it is realized that the teacher is the pivot of the educational system. The University Grants Commission has realized the need to resolve this dichotomy. The result is the creation of the HRDC. The intention of the University Grants Commission in sponsoring the HRDC and the establishment of Human Resource Development Centre in 67 universities in the country is to bring about qualitative improvement in higher education. The objective of the course is clear, to strengthen the teacher's motivation and attitudes in his/her quest for excellence. It is also the desire of the University Grants Commission to inculcate a sense of pride in the young teacher in his/her belonging to this noble profession. The scheme is not meant to produce mere trained teachers and thus has no pretensions to duplicate traditional teacher training programmes. This programme is designed to enable the teacher to discover for himself his potential through a positive appreciation of his/her role in the total social, intellectual, economic and moral universe within which he/she functions. Therefore, the Rastogi Committee has also recommended the link between staff development and career advancement. 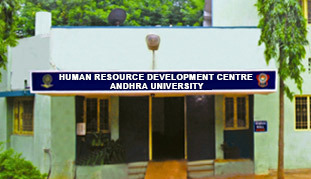 Andhra University is one of the earliest in the country to start the Human Resource Development Centre. In fact, Andhra University has the distinction of being the first in the country to experiment with a similar 4 weeks training programme for university lecturers with the assistance of the UGC in 1985.